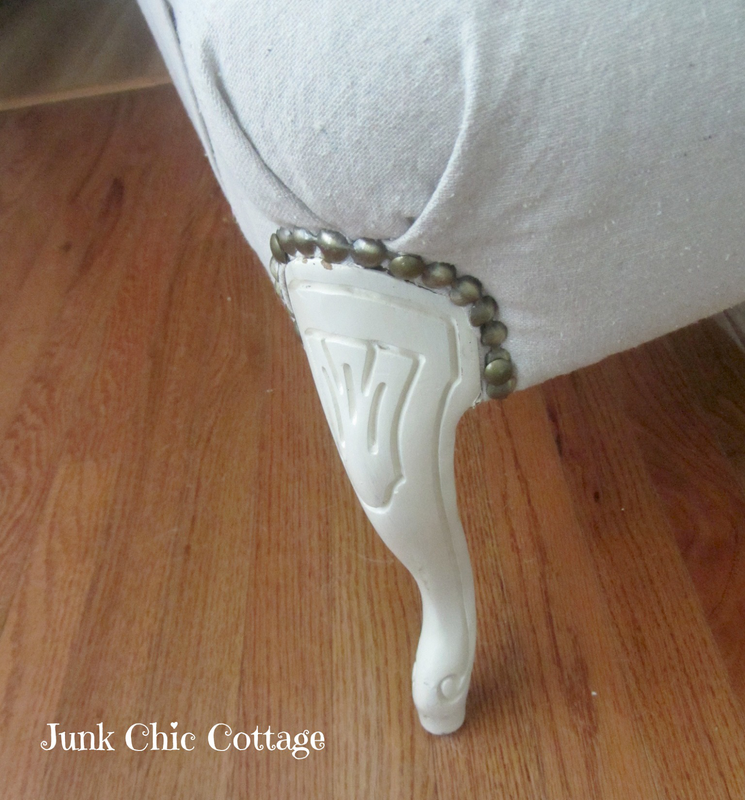 Junk Chic Cottage: A Chair with My Name on It! A Chair with My Name on It! Happy Thursday. 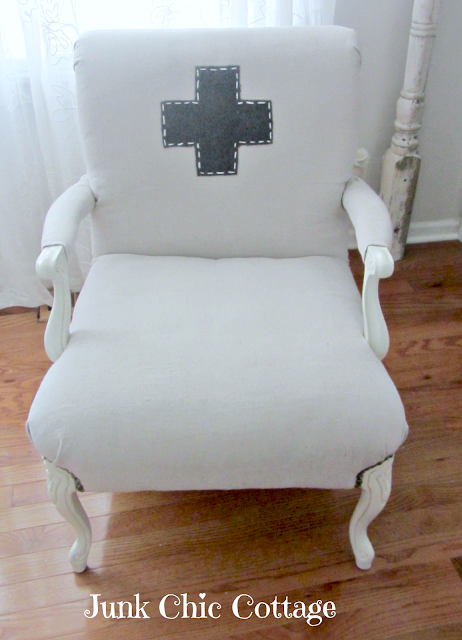 I wanted to share with you the chair I scored yesterday while out junkin with a friend. We went to this cute little shop and I found a cute chair that had my name on it!!!!!! 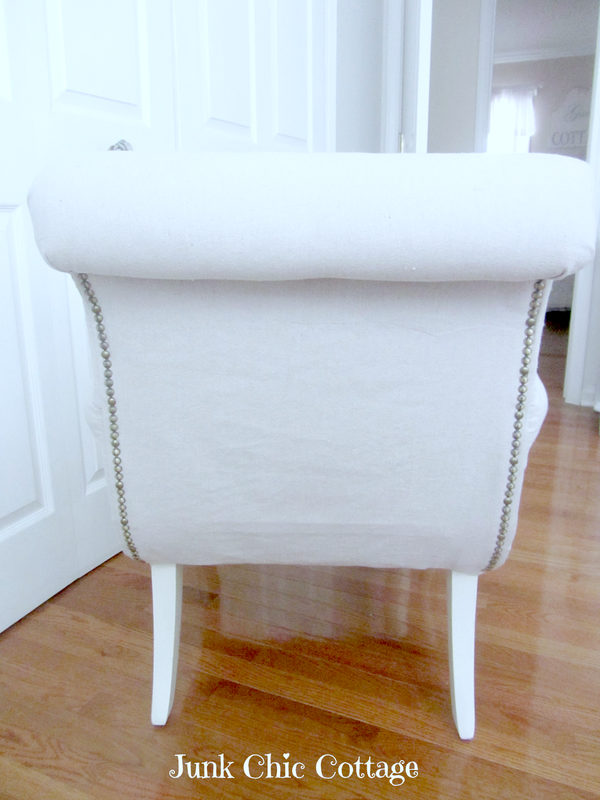 This was the white slipcovered chair I found at Ikea. She was sweet but while my friend and I were shopping at this cute shop I saw this beauty below. Look at her lovely light grey fabric and her beautiful curves. 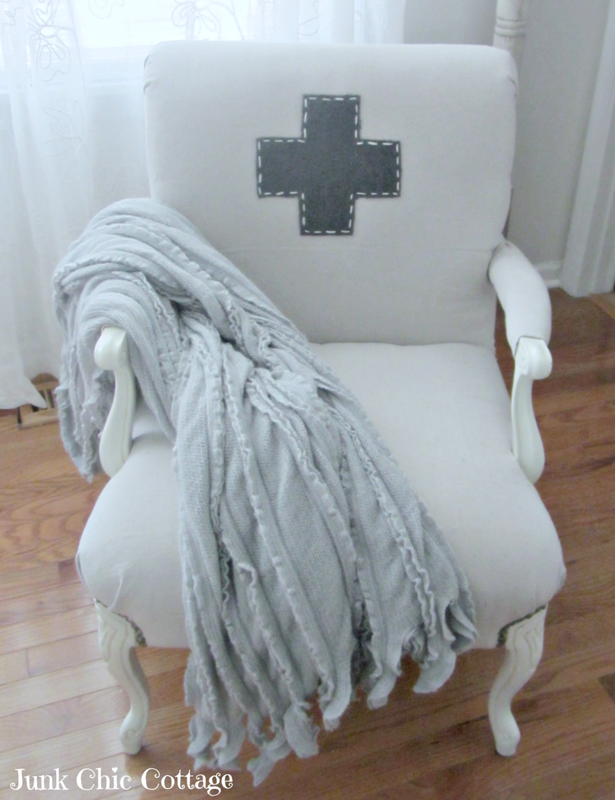 I am a nurse so the cross on this chair spoke to me too. Look at her beautiful curved back and those wonderful vintage rivets. Love her cute chippy legs. They had so much character. Well there she is. I was not planning on finding a chair for the room but so happy she and I met yesterday at the cute little shop. It was love at first sight. The Ikea chair that I had in here is going back. I just love this one so much better. It's also the swiss flag, though it would be red and white too. Love your find! It's perfect. That chair is sooo gorgeous! It has so much character. I'll take vintage over new anytime. I bet that chair has a few stories to tell. What a wonderful find! Even extra special because the symbol has some meaning for you. You know I love everything you do!! The master is so peaceful and romantic now. Great job!! Love! It's perfect for you. Congrats on a great find! That chair is perfect! Love the details of the cross (grey!) 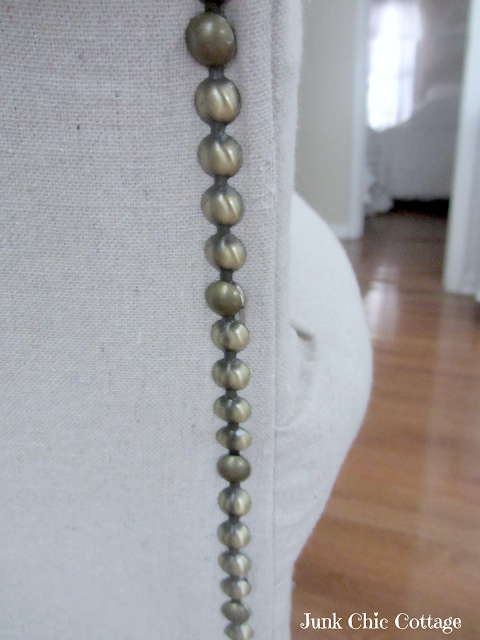 and the upholstery tacks. Good purchase! That chair definitely has your name on it! Great find! I vote for the new chair, Kris! It was customized with you in mind and in the perfect color, too! Enjoy your newest find! Oh, what a fun chair for you. I thought of you when I bought fabric for our guest room curtains. The fabric is very YOU. You might just get something made from it if there is anything left over. Your chair is absolutely adorable! I would have taken it home, too! Oh yes...I like her much better than the Ikea one...awesome find! I like your new chair better - much better and it is perfect Kris. Will go perfect in your new bedroom. Have a great weekend. Hope you don't get snow. My son was born in Chicago 12/6/60 and is was snowing and about zero. Burrrrrrrrrrr. Very pretty and perfect for you! Love your new chair...it is so you!! It's so much fun when you spot the perfect thing! You know instantly you want it. I try to wait and really think it through fut always end up going back to it. Heaven forbid it not be there... it's not a pretty moment! Awesome find! I love when that happens. It just all falls into place. How in the world did you find such a fab chair? You sure put a great big smile on my face this morning. That chair really did find a great home. Absolutely perfect. Hope she is comfy too. LOVE this chair, she is a beauty!!! It screams Kris. LOVE that chair Kris!! I love the cross on it too! So many great details. Just perfect! Great find! 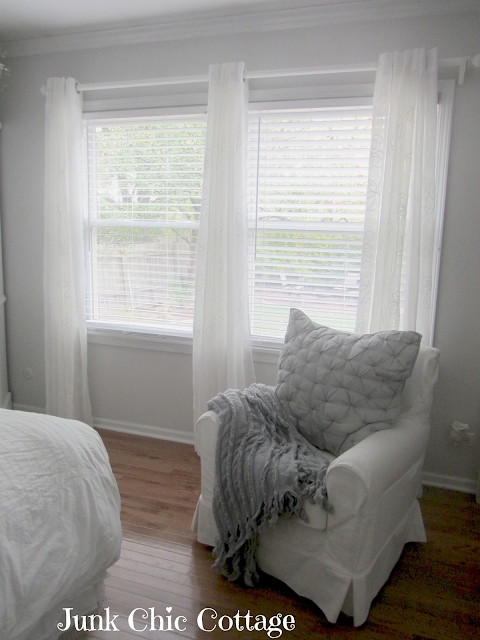 This chair is perfect in your room. The cross on it is very original. What a BEAUTY, and it just has to have been made for you with that cross on, how perfect! On a personal note, I'm absolutely THRILLED to tell you that I'm sleeping in my new, downstairs room for the first time tonight, and have had my first bath in FOUR months, after Paul installed it today. If only my back weren't so bad I'd be doing a jig in celebration, lol. What a perfect find, Kris! It is very unique, for sure. I love your new chair, Kris! It is pretty and so unique. I adore your chair. I have two chairs kinda sorta like that in away. lol. I love them so! Oh my, what a find! I love it, but what's that I see written on it? Oh, it's just your name. lol! The cross is perfect and so unique! Love, love it! Beats Ikea all to you know what! WHAT! !~ I love this chair Kris, what an awesome addition...pretty! Fireman Room Junk Chic Cottage! When is a Door(s) a Wall?